The best way to prevent cavities and periodontal disease is by practicing good oral hygiene by brushing and flossing techniques, performed daily. 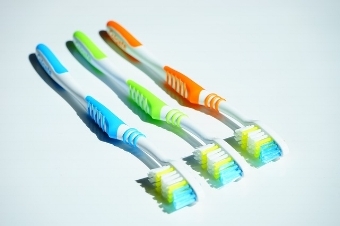 We recommend using an electric toothbrush, like SonicCare or an Oral B. If you are using a manual tooth brush, we recommend using a soft tooth brush. When brushing, position the brush at a 45 degree angle where your gums and teeth meet. Brush in a circular motion several times using small, gentle strokes. Use light pressure while putting the bristles between the teeth. Follow the same directions while cleaning the inside of the back teeth. Hold your toothbrush vertically to clean the inside of your upper and lower teeth. Clean your tooth biting surfaces with short strokes. Try to watch yourself in the mirror to make sure you clean each surface. After you are done, rinse vigorously to remove any plaque you might have loosened while brushing. Flossing is a great way to remove plaque between your tooth surfaces. By following the proper technique, you can prevent cavities and ensure oral health. Cut your floss (waxed is easier) in a piece about 18” long. Wrap most of the floss around the middle finger of one hand and wrap the remainder around the middle finger of the other hand. Clean the upper teeth by gently inserting the floss tightly between the teeth using a back-and-forth motion. Do not force the floss or try to snap it in to place. Bring the floss to your gum line. Slide it between the gum and the tooth until you feel light resistance. Move the floss up and down on the side of each tooth. When your floss becomes soiled, turn from one finger to the other to get a fresh section. Repeat for your lower and back teeth. Be sure to rinse vigorously with water to remove any plaque and food particles. Your gums may bleed or be sore during your first week of flossing. As you make daily flossing a habit, your gums will adjust and the bleeding should stop.